Celebrate the castle’s official re-opening with our spectacular medieval tournament and re-enactments. Let the children explore the castle and its grounds, complete with medieval sports, live music, fire juggling, storytelling and arts and crafts. Guided tours of the castle available. The castle has had a £3.1 million conservation project, which has seen the Visitor's Centre put inside the chapel, and a glass bridge constructed so that visitors can access the chapel top floor, but still have a clear view from below. Much restoration and conservation work has been done, including improvements to the grounds, and better access. The chapel has been named 'Alina's chapel', but until now there was no detailed information about who Alina was. 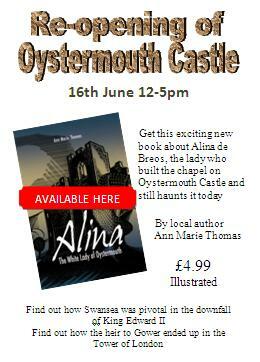 My book, Alina, The White Lady of Oystermouth fills that need, and will be sold inside the castle. I have produced a poster linking the book to the re-opening, which will be distributed in the next week to all local outlets selling the book.